The ultimate blackout cellular shades. 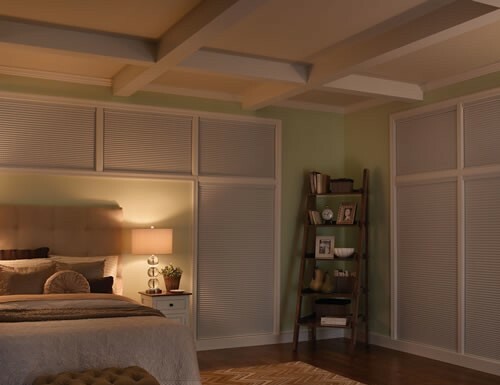 SlumberShades combine blackout fabric with energy saving sidetracks as well as top and bottom seals designed to block light from entering along the sides of the shades. SlumberShades create a comfortable, dark environment ideal for sleeping. SlumberShades block both light and air leaks on all sides of the shades. Made with double cell honeycomb fabric, SlumberShade insulating blackout shades save energy and lower energy bills. Sidetracks of your color choice lined with black interior for light control. Fuzzy top and bottom seal to ensure the best possible light control. Bottom magnetic seals on cordless shades to keep shade tightly closed at the bottom. Standard headrail color coordinated. Continuous Cord Loop, white with color coordinated insert. Note: The widest width of the window cannot exceed the narrowest by more than 1/4". With SlumberShade and a light shade color, does any black show insider the room (say around the tracks)? No. The SlumberShades are made with blackout fabric that has a mylar coating inside the fabric cells. The sidetracks will be the color you choose. The interior of the tracks will be black to block light but the black will not be visible unless the window shades are open. What is the fabric? How does it do with condensation in the Winter? The cellular fabric is made from spun polyester with a mylar coating inside each cell to block the light. With the added sidetracks these window shades block the light from entering the room. The SlumberShades come with sidetracks that stop the light as well as insulate better. If your windows have condensation because they trap air between the windows and the shades there will be more condensation. Can the SlumberShade 3/8" shades be mounted on the outside of the window? In other words, mounted on the wall itself, not the window? Unfortunately the SlumberShades must be mounted with an enclosure or inside mount only. The reason for this is that the side tracks must be mounted to the sides of the window frame. Im sorry but because of the track system this is only an inside mount product. We do have other black out cell shades that will work perfectly as an outside mount though. Let me know if you need some links. I ordered 2 equal size blackout shades with side tracts for 2 windows that are just under 5ft tall and wide. I ordered 2 equal size blackout shades with side tracts for 2 windows that are just under 5ft tall and wide. They provide virtually 100% total black out. They look great and are both easy to install and manually open and raise. I am an extremely happy customer. Here’s hoping that the quality will last for many years to come. Rec'd blinds before estimated ship date. follow. Black-out blinds w/side channels provided us with light control we desired for our bedroom. I installed this on a bedroom window - love the rails that keep the light from leaking in on the sides. I highly recommend the blackout slumber shade for anyone who requires a pitch black room on a sunny summer day. I highly recommend the blackout slumber shade for anyone who requires a pitch black room on a sunny summer day. I'm a long time insomniac who struggles with sleep, particularly in the summer months when bright light bleeds through blackout curtains at 9:30pm. These blinds make the dark 'tomb' environment I require possible. Chose standard style - installation hardware for header required use of pliers to open the hook/lip a bit, as it arrived without sufficient clearance to lock the header in appropriately. Otherwise - very easy, perfectly fitted, quick shipping. I live in Fresno where the summers are unbearably hot. I live in Fresno where the summers are unbearably hot. There are two rooms in my home with south-facing windows and during the warm weather, they were always 5 to 10 degrees warmer than the other rooms. I installed these shades a couple of weeks ago. The temperature outdoors is currently at 90 degrees and for the first time, the south-facing rooms are staying as cool as the rest of the house. These shades are a godsend. The company rep was very informative regarding which window coverings would provide the best thermal insulation. I am very pleased with the purchase of these shades.